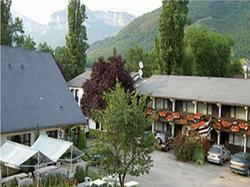 Hotel Neiges de France is located in the centre of Challes-les-Eaux 7 km from Chambery. It offers en suite accommodation, free on-site parking and free Wi-Fi. Rooms at Hotel Neiges de France are equipped with satellite TV and a private bathroom. Neiges de France serves a buffet breakfast that guests can enjoy in the dining room or on the terrace during nice weather. Lyon-Saint Exupéry Airport and Geneva Airport are a 1-hour drive away. This triple room offers 1 single bed and 1 double bed or 3 single beds.